As posted earlier, you can now Schedule Posts on Your Facebook Page. Google+ is expected to launch scheduled updates very soon but its not available yet at the time of writing. But you can still schedule updates on Google+ using the DoShare extension. DoShare is a free extension for Google Chrome which lets you schedule posts for your Google+ profile, which are then automatically updated at the specified time in future. Using DoShare extension is very easy. First login to your Google+ account, then go to this link from Google Chrome browser and install it. Once installed, you will see a small DoShare icon in the toolbar of your Google Chrome browser. Click on this icon anytime to start writing a scheduled update for Google+. You can add anything to this scheduled update, including text message, links, or images. Once you have composed the message, select the circles to which you want to share this scheduled update. Then click on the Schedule button to select a future date when this update should be automatically published on Google+. DoShare extension works great if you want to schedule a post on your Google+ profile but it has some limitations. You can’t schedule a post for Google+ page, it works only for personal profiles. And you must use Google Chrome to use DoShare. The biggest issue with it is that, all your scheduled Google+ posts are saved on your computer only. They are not saved (synced) on web. This means that you cannot edit these scheduled posts from any other computer. Also, they will be published automatically only if your computer is turned on, connected to internet and you are logged into Google+ at the scheduled time. 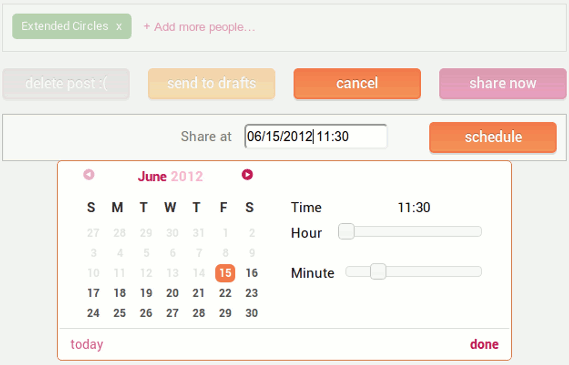 Keeping the limitations in mind, DoShare is a great tool to schedule updates on Google+.